Highway 2 outside of Towner, North Dakota. When I drove back home this summer from Santa Fe to Dunseith, North Dakota, I was met with some unexpected detours. 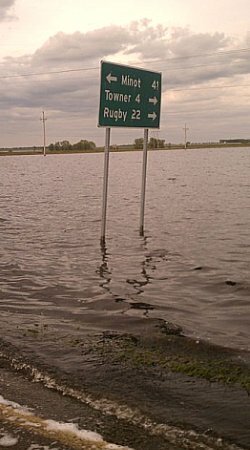 My Gramma had told me that the river levels in North Dakota were exceptionally high this year, and that city and town officials were expecting flooding this summer. They were bracing for it — sandbagging late at night, building levees and dikes, and bringing in the National Guard. The Souris and Missouri Rivers in North Dakota were reaching record levels because of increased releases from both Canada and Montana. We had a very wet winter with lots of snow, and the spring had been very rainy as well. So we were (and still are) getting it from both the north and the west. To the east, Devil’s Lake is also rising, threatening to take out portions of Highway 2. 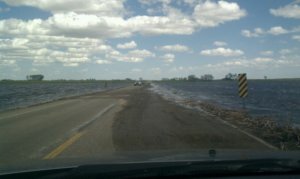 As I headed north from Bismarck to Minot, I noticed water in the ditches, but didn’t really think much of it. It wasn’t until I turned east towards Towner that I realized how bad the flooding was. Highway 2 just out of Towner was closed due to water on the road. The Souris River (also called the Mouse River), which runs through Towner, was at an all time high for that area, and officials decided to close the road the night before. As I turned around to find another route (there are 4 different ways that you take to get from Minot to my hometown of Dunseith), I noticed that every northbound road was closed. 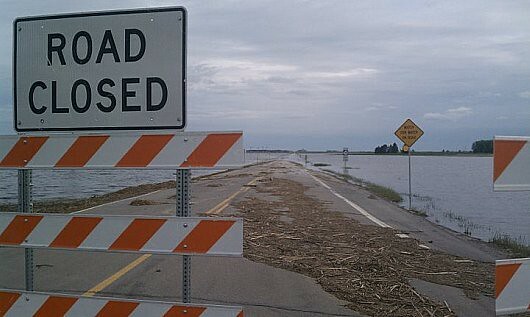 Thankfully, Highway 83 north of Minot was still open, as was Highway 5, which I took east to get home. (photo left: Highway 5 as I drove down it.) Now, Highway 5 is permanently closed due to water on the road. Recently, one truck driver ignored the signs and tried to go through the water and was left stranded. Boats had to rescue the driver. Various dams in Canada released more water yesterday, and homeowners in downtown Minot were evacuated this afternoon. Minot is our closest ‘big town’ where we do most of our shopping. I am supposed to fly out of Minot on Sunday. With the downtown area expecting to flood tomorrow, I won’t be able to take Highway 2, and with the other routes permanently closed, I’m going to have to get creative with my detour choices to get around the Souris River. We have many small local dirt roads, but those are also being washed out. We will see! 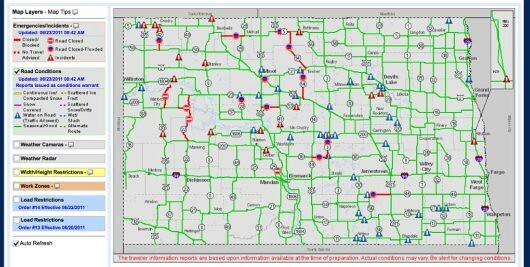 Below, the image on the North Dakota Department of Transportation travel info page, June 23 2011. The red lines show closed roads. Click on the image to see it at full size. Post and photos by Jessica R. Metcalfe. This post is from Transit Secrets: The Unknown Paths from Point A to Point B, a current series on CoLab Radio.